Police in North Vernon, Indiana say it is obvious this man had a death wish. That may not be so uncommon for men his age and perhaps in his profession, but he accomplished it in a very disturbing fashion. I've followed the events in The North Vernon Plain Dealer & Sun, but I do find it somewhat unnerving that the story is making the rounds through many newspapers in central and southern Indiana, as I fear widespread dissemination of the story may open the door to copycats. Unrelated bonus mugshot from the same paper of Nikkiah C. Weddle, a loving mother, that just appears slothful. I feel that her having smoked marijuana three weeks earlier will play a heavy role in her defense, since we've all smoked a joint that we took almost a full month to recover from. I have two news oddities to present from one of my local papers. The first from The Greensburg Daily News I didn't think was so odd, I would expect the electric company to do such things to avoid displacing wildlife, but I couldn't figure out if the 'secret technique' was really an extraordinary trade secret (I would actually expect them to want to share such info so other companies could put it to use), or just a case of a lazy reporter. The second from the same paper details five new residents of the county jail. 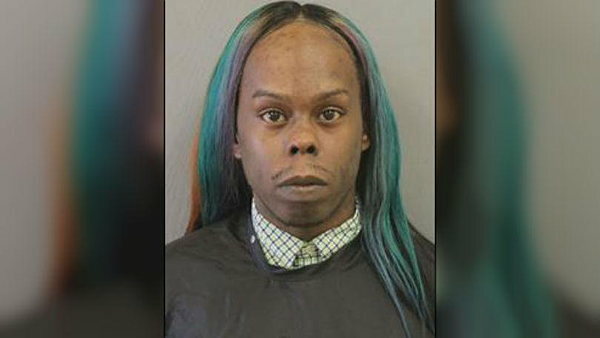 Alas, there is only one mugshot. These five actually had uniformed police knock on their door, and they didn't answer. So the police set up a perimeter around their apartment for two hours while waiting for the search warrant. With two hours to play with, none of the suspects noticed a cop banging on the door or the perimeter placed around their apartment? And they couldn't destroy a small amount of dope and paraphernalia in the meantime? Your Daily Jury Duty: What Are They Doing At the Heroin House? We have Adam D. Goff, just trying to sell magazines to pay for college. But will that dream be deferred with a detour through Indiana's Department of Corrections? Check out the mugshot and order your photo reprints. The story courtesy of The Greensburg Daily News. Unrelated mugshot and story from the same edition. Shane Michael Koors, age 21, stands charged with creating a "Crazed Ruckus In Clarksburg." Check out the mugshot and decide his guilt. Then read the article and decide it is deserving of the title. Can anyone tell me what that is in and around Mr. Koors' left nostril? Your Historical Daily Loser - Edward Blaine was having a bad day. How bad was it, you ask? When he tried to rob a bank in Port Royal, Virginia, he dropped half the money on the way out, then discovered he had locked his keys inside the getaway car. That's when the angry civilians caught up to him. He tried to flee but was run down and in the struggle he managed to shoot himself in the leg. The Story. Jury Duty - The expression on Joseph Monahan's face is priceless. He's been charged with disorderly conduct in a licensed establishment. Disorderly conduct is defined as acts that are of a nature to corrupt the public morals, or outrage the sense of public decency, etc. A licensed establishment is, for lack of a better word, a bar. Now correct me if I'm wrong, but, isn't a bar the perfect place to commit acts that could corrupt the public morals? Your Daily Loser(s) - I normally use this space to highlight the stupid actions of regular folks who are caught breaking the law in some way. Today, however, the honor of being a Daily Loser goes to a few police officers, in Baltimore, Maryland. You see, Joshua Kelly and Llara Brook, of Chantilly, Virginia, went to watch the big game between the Orioles and Kansas City in Camden Yards. But they had never been to Camden Yards before, so... they got lost. Read the story to find out how the police reacted when Joshua and Llara tried to ask for directions. Jury Duty - There is a long history of people taking the law into their own hands in order to mete out justice. Jerome Ersland of Oklahoma City, Oklahoma, is now firmly established in that history. Ersland has been charged with first-degree murder for killing a teenager who tried to rob his Pharmacy. The Story. Your Daily Loser(s) - Look kids! A new game! Joshua N. Sizemore and Amanda L. Madison of Lakewood, Washington, wanted to play strip poker, but they didn't have any cards. At least, that's the only reason I can think of for what they did next... They decided to throw baseball-sized rocks onto cars from a bridge over the interstate. If the left headlight of a car broke, Amanda had to remove some clothing. If the right headlight was broken, it was Joshua's turn to get naked. The police were not amused. The Story.